2. The Keeley Compressor Plus Is A Winner! There are a few different features working together to make this happen. let’s look closer. But What About Compressors Being Too Noisy? Where In The Signal Chain Should I Add A Guitar Compressor Pedal? The Best Compressor For Metal? What is the one sound effect that every professional studio uses? It’s compression. Compression is used in every professional radio mix. It makes the quieter parts louder and the louder parts quieter. By narrowing the dynamic range, you can create more clear tones and a better sound. Used sparingly, compression helps accent the right tones, producing a cleaner sound and notes that flow together. 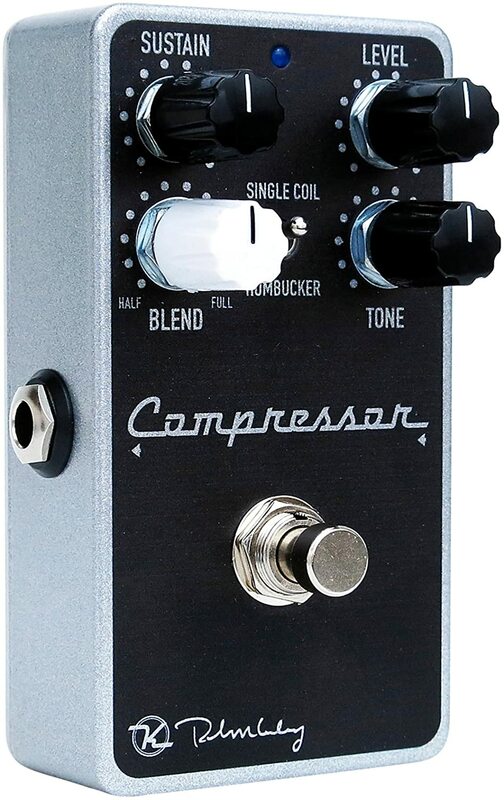 If you are constantly frustrated that your sound isn’t quite “right” it might be that you are missing the professional sound a compressor pedal can bring. (Click Here To Read More About What Compression Does). For you pros that already know what’s going on with compression pedals, we’ll get right into the reviews of the best compressor pedal. 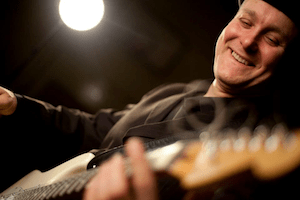 After all, you probably have some funky grooves or high-speed country picking that you need to get on top of. As you have already discovered, there is a wide range of compressors available. Which one is going to give your playing that “pro” sound that will take your playing to the next level? The TC secures the top spot for its studio-quality level of control. There are a lot of guitar pedals on this list that offers multi-band compression, but this one tries to deliver more of that studio-recording sound, winning our top spot. But this compressor isn’t a one-trick pony. It likes to please everybody, and it does a mighty fine job of it. Now, a lot of you might want the classic stompbox compressor sound. This is all you need. But it also has some flexibility. There is a little knob that lets you toggle between “vintage” which lets you run it like a standard old-school stompbox compressor. Then you have “spectra” which resets this as a studio guitar compressor with that light touch that delivers a professional tone. Finally, you have “Toneprint”. Toneprint is the proprietary app that connects your phone to your stompbox and allowing you to customize your own unique compressor range by adjusting every single element of the sound. For those of you running it on vintage mode, you’ll have your “sustain”, “level” “attack” and “blend” knobs. “Blend” controls how much of the “wet” sound you are hearing. When turned all the way up, the Blend knob delivers 100% compression signal. Dialing it back allows less compression to come through. It’s this granularity of control that sets this pedal apart. “Attack” is how quickly compression will be applied to the signal. Turning it to the right increases how quickly the compressor will apply after you play a note. Decreasing the attack also decreases the “click” or “pop” that you get with a compressor. “Sustain” is the knob you find on every compressor. It controls how much compression will be applied and how much the lows will be raised and the highs will be lowered. It also helps to set the release times. It’s easy to overdo it here and typically a low-to-moderate setting is best for most playing. “Level” is analogous to the “gain” on some of the other systems. It controls how much signal is coming through and allows you to increase the volume in order to compensate for the volume decrease that comes from compression. Finally, this a true bypass which means that when you turn it off, it truly is “off” and does not impact your sound. I am probably the only person who is going to put the Keeley Compressor Plus in the number 2 spot. You see, for a long time, the over-priced Keeley 4-knob held the number one spot on our list. And it was a doozy. There were features on that compressor that I have yet to find anywhere else. With that pedal discontinued, I’m pleased to find many of the same features in the Compressor Plus. When Robert Keeley first started pulling apart other companies’ effects pedals and repairing and modifying them, he had no idea that his company would one day be at the top of the FX signal chain on many setups. Using his electrical engineering background, Robert started developing different pedals, and today the Keeley Compressor is really the industry-standard for low noise, high-quality compression. In fact, this one sounds so good it has often been compared to rack-quality equipment. That’s a lot for just being a stompbox. The bypass switching circuit means that when it is off, it is off. None of this latent humming. As with most setups, the sustain knob controls the amount of compression being applied. And the Blend control determines how much compression you allow into the signal. The Level allows you to increase the volume to compensate for the quieter sound. So far, it is pretty similar. But there is a fourth knob. This tone knob is unique. It enables you to bring back the volume on the higher notes that tend to get squashed out of the sound. This gives you a unique tone for solos, and offers a different guitar tone than the other compressors. If that isn’t enough, this one has a switch that specifically sets this unit up to work with humbuckers. 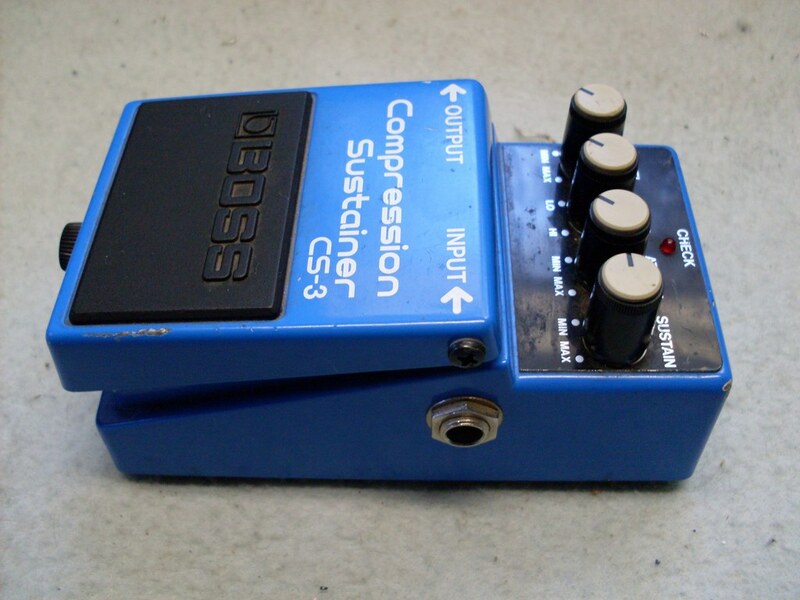 Guitar compressor pedals are so often used on single-coil pickups that they don’t sound that great on active pickups. With a flick of the switch, you’re delivering one-of-a-kind sound. I realize that the hyper Gravity has some cool stuff like app integration with your phone. However, I’m a simple man. I just want to play. And the Keeley provides fast setup and the best sound in the industry. If you are looking for a professional sound with little to no noise in an easy to use stompbox, the Keeley is going to deliver without overcharging. This is the go-to pedal for many guitar players who want to play clean melodic guitar licks without spending a fortune. 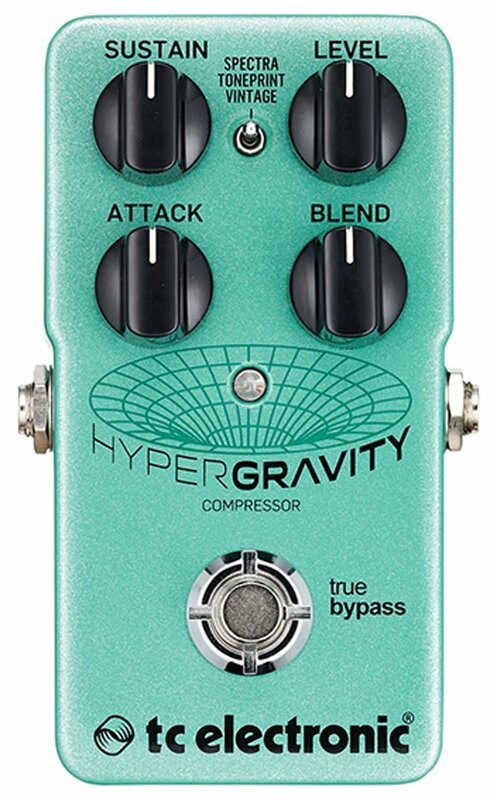 This pedal is great for flattening dynamics so your notes can cut through the band without relying on distortion or introducing the dreaded hiss that comes with a low-end pedal. This one has the attack knob that allows you to control how quickly a note is picked up and creates that definitive clarity between each note. The more attack you use, the more each note is articulated. The sustain knob controls how long it continues to compress the note before releasing it as it becomes too quiet. It also helps you to hold a note longer before it dies, making those beautifully screaming solos easier to manage. Just as with the Keeley, the tone knob allows you to protect that top end sound and make sure the higher notes are clearly heard. It’s one of the features I really like about this effects pedal. You can adjust it from “darker” to “lighter” and it is surprisingly pronounced. And then level controls the output level or volume control. This unit has an affordable price, but shouldn’t be skipped over. You could argue that it works just as well as many of the more expensive ones. It is an excellent for funk and jazz. This is also a good choice for those playing an acoustic guitar. It helps to even out the tones and the sustain works well as a solo effect or with a chorus pedal. This company is a legend. Their vintage compressors still sell for hundreds of dollars (when you can find them.) They’ve always been a major player in this field and their compressor is one of those that our Grandparents loved. It’s warm tones and long-lasting sustains has influenced American music for decades with brands like Keeley striving to emulate its tone. Now you can love it, too. Ross emulators are everywhere. The Keeley Comp above is a modified Ross. 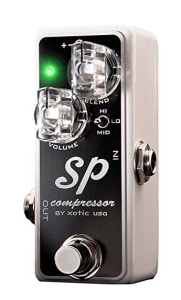 The Xotic SP is another Ross compressor emulator. The sound was so popular, everyone wanted to create a similar pedal and it still forms the framework of many of the pedals you hear today. In addition to the great tone, what I love about this setup is how simple it is. You have the hi-med-lo settings to choose how aggressive you want your sustain to be. And then there is a blend knob to allow you to adjust how much compression is mixed in and a volume knob to amp things up when you need it. If you need more control, there are some internal switches you can set. At first blush, the fewer knobs is going to turn a lot of my readers away. But those of you who have been playing for awhile know that you rarely adjust this effect once you get it setup the way you like it. For most guitar players, this is all you need to bring a little more professionalism to your playing. The best compressor for country artists. 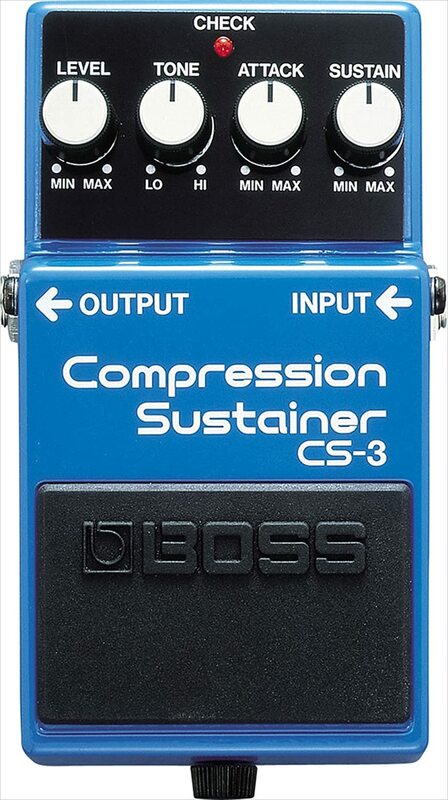 As the best compressor for country music and telecasters, this is a compressor that I might should move up on the list. Less known than some of the other brands, it’s on the boards of the likes of Brad Paisley and Keith Urban. 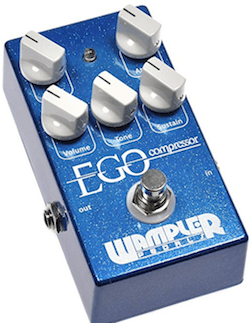 The Wampler offers a lot fo easy adjustments to dial in the effects you are looking for. If you’ve been reading all of the reviews, you’ll notice the similarities of the Keeley, the Boss and the Hyper Gravity Pedals. There’s the attack that let’s you choose how quickly the compression kicks in. And then you have the sustain for amplifying the quiet notes and keeping them in play. The tone knob helps preserve those high notes and the volume controls the output level. The blend knob will go from 0 effect all the way to 100% effect, allowing you to have complete control over how you use this pedal. As a 5-knob pedal, one could argue that it has the best features of all the pedals on this list. But where this unit really shines is in how it preserves the sound of your instrument. It doesn’t shade or color it, and seems to deliver some of the brighter tones of many of the ones I’ve listened to. Definitely, for the country artist, this is the one to go with. I’m not really sure how you are supposed to have “pig” and “philosopher” in the same title. But then, this company is full of contradictions. They have created some of the most cutting-edge pieces of equipment… but so much of it is centered around the legendary sound of vintage guitars. They are like the cutting edge of history if you will. Which brings us to the Philosopher. What is really unique about the Philosopher is that it does not use the CA3080 chip. It’s like the only compression pedal that does not use this chip. Not content to run with the herd, Pigtronix retained the legendary Howard Davis and had him design a compression circuit that delivers more clarity with less noise. It is also why they could easily add the sustain effects into this package. In real life, this little unit is impressing musicians all over. It doesn’t color the tone. It sounds great on a dirty amp. Or a clean amp. And for bluesy and funks, it delivers just the right amount of sustain. However, the consensus is that it isn’t “soft” enough to really lay down a fast chicken-picking line that you country boys (and gals) like. The grit delivers diode-powered clipping for a warm and fuzzy sound… and the compression is just enough without suffocating your tone. The branding may be slightly contradictory, but the sound isn’t. If you have been dissatisfied with the other units you have tried, I suggest you give the Philosopher a try. They should rename this one “The Legend”. 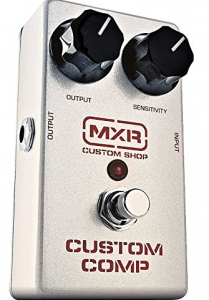 One of the longest-running successful boxes out there, MXR line from Jim Dunlop has been holding down the “king of the mountain” position for years. There are a few reasons for this. For starters, it is an affordable box. Always has been. You can literally buy it with a week of paper route money if you want to. And then, it is simple to use. You have two knobs for the stuff you need to adjust all of the time: your output and the sensitivity. However, your attack and trim settings are an internal control which keeps you from always bumping them mid-song. But, it does limit this pedal’s adjustability. When you get your pedal, follow the instructions to take the back off and get the sound customized to your taste. Then, they went through and eliminated pretty much all of the noise. 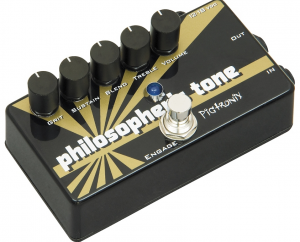 Now, it doesn’t have some of the better noise control that the Philosopher or the Keeley have — but then I’m speaking very subjectively. You could argue with me on that, and I’d listen. What isn’t subjective is how bomb-proof this metal can is. They put so much care into their construction, that you can find plenty of used Dunlop MXR pedals selling for more than the price of the new models. I mean, if me and an actual bomb are ever in the same vicinity of each other, I’m going to try to climb inside my pedal. It’s that durable. 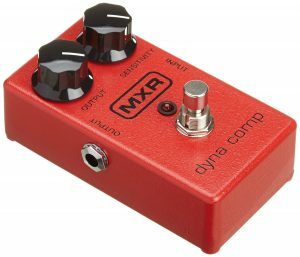 While the red box “Dyna Comp” has been the mainstay of the MXR line for a long time, I’m going to recommend that you go ahead and step up to this “Custom Comp” CSP202 model. The added noise control is worth it, in my opinion. Basically, it’s offers a lot of sound for less money. So go run your paper route and then come back and get this one. So I alluded to the Dyna Comp before when reviewing its “Big Brother”. The Dyna Comp was really the box that got it all started and has been used and reused and then fixed and resold. It’s one of those boxes that has so many fans it will probably always be around. It uses the older CA3080 chip (the Super Comp uses the CA3080A) and the end result is a much twangier sound that is good for funk. I frankly, don’t think it sounds as clean as the other boxes do. More noise and a lot of those quieter tones that should be suppressed, end up getting amplified. I’ll probably get death threats for saying that. But I’m ranking it well above all of the other little wanna-be comps out there. There just are none in my opinion that I’d buy besides the 5 on this list. And I would go for the Lemon Squeeze over this one because I like the sound better. Sure, Amazon has $30 comps. But you’d be much better off spending $10 of it on beer and sending the other $20 to a nunnery somewhere. So when it comes to the economical range it is either Dyna-comp with its twang and rich history of durability. Or it’s the Lemon Squeeze with its lesser history but more modern sound. Decisions, decisions. While you are making up your mind, here is a face-off between the Dynamic and the Super Comps. Basically, think of it as taking the louder tones and making them quieter. And taking the quieter tones and making them slightly louder. When you do this, you get a flatter sound wave line that transmits better and is less “messy”. When the sound gets too loud, it is softened. And when it is too quiet, it is made louder. Compression has been around in one form or another since the phonograph. Back then, they used to do it manually when mixing a recording. The Engineer would painstakingly go through the recording and any high that was too “hot”, they would limit, and tone it down. Lows that were too quiet were made louder so that the entire song had a more uniform sound. Over time, our audiences have become very accustomed to hearing a compressed sound. All of our radios use it. All of the TV stations use it. Trying playing a gig without one, and you are immediately dismissed as being unprofessional (depending on how much you get carried away, that is). Compression is essential for voice. And you can hear the improvement it makes. Humans are notoriously bad about being inconsistent with volume. By using a compression effect, you can modulate that volume into a tone that sounds great when amplified. Compression is part of the reason why you don’t have to constantly be raising and lowering the volume in your car multiple times throughout the song. The same thing goes for a guitar. So, we’ve already discussed the basics. Overall, this delivers a cleaner tone. This is especially true for funk, country and any style where fast, clean picking is key. Without compression, the first strike of every string tends to be the loudest and over-shadows the rest of the note. Your sound can rapidly disintegrate into a muddied mess if you aren’t careful. Many guitar compressors allow you to tell it how fast to “attack” any sound that crosses the threshold of loudness. So you can let it control every loud noise aggressively, or you can let it hum for a moment before reining it in. While a fast attack can give cleaner sounds it is probably better to use a slightly slower attack to allow for a more subtle sound. After all, the whole aim of compression is to give your playing a more professional and “natural” (to the listener) sound. Technically, compression is thought of as “limiting” the high sounds. However, it also raises low sounds — to an extent. So when you strike a note, it will not die away as quickly. It kind of lingers. Almost a sustained effect. However, when the note is done, the die-off is immediate. Here’s a photo to help demonstrate. Depending on how you adjust your compressor it can have a more abrupt or more gradual release. A lot of people complain about compressors adding “noise”. However, the compressor doesn’t add any noise. They simply make quiet noises louder. So that buzz coming from your humbucker? Yeah. It’s gonna be a little louder. So it can amplify equipment deficiencies further up in the line. By spending more on one of the top compressors, you get less buzz and more control. Your compressor is going to modify everything that comes before it. So it can dramatically effect the sound that you are sending to the amp depending where in the chain you insert it. Typically, guitar players use it as one of the first effects pedals in their sequence. This allows you to edit the output of your guitar and clean it up before you run it through the rest of the effects. The key to remember is that, for most playing, you will want to go light on the compression. A Little goes a long way. Using too much can cause your playing to sound flat and lifeless. I wanted to put this in here really quickly for the newbies. Sometimes with metal, the sounds are muddied and you are unable to recreate the tones that you envisioned. So what compressor should you get to add clarity? The thing with metal is that you are pushing your equipment to the limit. You are likely running with a drop tune setup, so the first thing you need to do (if you haven’t) is to upgrade the gauge of your strings so you can get the correct tone. The next thing is that you need focus on your playing skills. It’s easy to flat-finger notes and mute the tones. Is your playing on point? From there you might look at amplifier limitations or in limitations of your pickup. It’s easy to overwhelm your amp with all of the gains. Feel free to talk back in the comments, but typically sound problems for metal guitar players is found in one of these other areas.